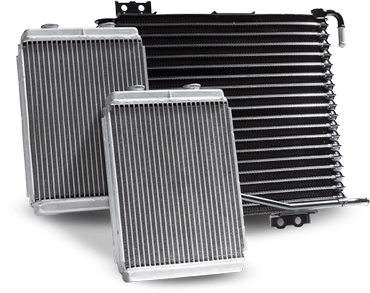 The radiator plays the very important role of cooling your car’s engine. A cool engine is crucial to the safety and functionality of your vehicle. Because of this, Milex Complete Auto Care has skilled professionals who understand the inner workings of a car’s radiator and cooling system. A common cause for vehicle breakdowns is a cooling system failure. To help prevent breakdowns and costly repairs, regular preventive maintenance on your cooling systems is a must. Engine coolant is very important in both the heating and cooling performance of your vehicle, as it protects and supports the entire system. But over time, the coolant properties can breakdown and become contaminated, causing clogging and overheating. Most vehicle manufacturers recommend changing the coolant on a regular basis and it should also be checked with every oil change service. With a Coolant Service from Milex, our technicians will thoroughly clean the cooling system and replace your engine coolant. This service will keep your car road-ready by extending the life of your radiator and preventing rust and corrosion in your cooling system, which will maintain proper heating and cooling of your engine. When it comes to your car’s cooling system, you can count on Milex. We take the time and care that this crucial car component demands. Every vehicle from domestic to foreign, as well as hybrid, diesel, four-wheel drive, and luxury automobiles are serviced with the same attention to detail. For more information about our radiator and cooling system services, find your nearest Milex today. What are the components of your cooling system? The system consists of a water pump, cooling fan, coolant reservoir, radiator, thermostat and hoses. When should you have your cooling system serviced? If your vehicle has experienced overheating, you should have it inspected immediately. A cooling system service is also recommended at regular intervals according to your vehicle’s specifications. Hoses should also be checked frequently and replaced as required. What are typical problems that you see with cooling systems? The most common form of wear and tear within the cooling system is the aging of the coolant and hoses. As the coolant ages, the compounds within it break down and cannot effectively cool the engine. Old coolant can also cause corrosion of the system components.